The third and final meeting of the year for the American Legislative Exchange Council (ALEC) just wrapped up in Scottsdale, Arizona, last week. On the day of ALEC's board meeting, Greenpeace attempted to ask ALEC's board of directors and executives about climate change science. ALEC CEO Lisa Nelson was not keen on speaking to us. ALEC has a long history of denying climate change. It continues to take payments from fossil fuel companies like Koch Industries, ExxonMobil, and Peabody Energy. It was part of the American Petroleum Institute's leaked plan to manipulate the public's trust in climate scientists, spelled out in an eerie memo from 1998. The group even hosts privately-funded events where ALEC legislators are taught how to deny climate change science by public relations consultants who have ties to fossil fuel companies. As for Lisa Nelson, she is on the board of a Libertarian think tank that promotes solutions to climate change. The Niskanen Center was named after the late co-founder of Charles Koch's Cato Institute, whose recent death led to an attempted coup of the organization by the Koch brothers. Some of Niskanen's staff are former Cato executives, who now support a carbon tax, perhaps the most viable policy solution to global warming. This has caused a rift between the Libertarian purists and the Koch network's hacks-for-hire, like Pat Michaels, the disgraced climatologist at Cato. Since Ms. Nelson has taken the helm of ALEC, she has lost over a dozen corporate members. Some of those companies--Google, SAP, and Shell--even condemned ALEC specifically for peddling doubt over climate change in their statements explaining why they have abandoned the lobbying group. Ms. Nelson has inherited a big problem. After decades of helping companies lie to legislators about climate change, the companies themselves and many of their front groups will no longer deny that humans are responsible for unnatural climate variability. But ALEC legislators have not received the memo, and if you ask them about climate change, they sound woefully uninformed. Almost as if they were paid to. Todd Wynn: director of ALEC's Energy, Environment and Agriculture task force, formerly of Cascade Policy Institute. Cascade and ALEC are two of the many front groups coordinated under the umbrella of the State Policy Network. In Friday's Wall Street Journal story, "States Cooling to Renewable Energy," American Legislative Exchange Council (ALEC) Energy, Environment and Agriculture Task Force Director Todd Wynn claimed, "I have not received one dime to work directly on renewable-energy mandates." Wynn may not have received a check where the memo read: "For your efforts to attack clean energy policies" but his ALEC paycheck certainly comes (in part) from fossil fuel interests. 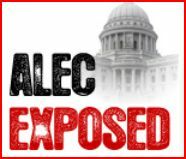 ALEC received approximately 98 percent of its budget from corporations, trade associations and corporate foundations, according to IRS 990 tax forms from the organization in 2009. The members (as of June 2011) of Mr. Wynn's task force include at least 23 fossil fuel companies and utilities, like ExxonMobil, Continental Resources, Peabody Energy and Duke Energy, that have a direct financial interest in slowing the growth of clean energy. Task force members fund almost all of ALEC's operations. ALEC corporate members each pay between $7,000 and $25,000 or more to be members. The corporate task force members also pay fees to have a vote on what pieces of "sample legislation" should be sent to state legislators. And, last fall, the energy task force members voted to push the "Electricity Freedom Act," which repeals state clean energy standards, through state legislatures across the country. So it's no surprise these bills are showing up and being pushed by fossil fuel interests and front groups in states across the country. Wynn probably received at least a few dimes to coordinate this effort to attack clean energy policies. If ALEC wants to provide some transparency on its budget, Checks and Balances Project would be happy to take a second look. Will ALEC block EPA coal pollution safeguards at Illinois' controversial Prairie State Energy Campus? The U.S. Securities and Exchange Commission is investigating the Illinois-based Prairie State Energy Campus, a combined coal mine and power plant spearheaded by Peabody Energy, co-owned by eight public power companies based in the Midwest. Numerous cost overruns from construction delays and equipment problems at the Campus resulted in customers in several states having to pay for power well above market price. While Peabody defends Prairie State Energy Campus (PSEC) from SEC scrutiny, a corporate front group has developed copycat legislation that could exempt dirty projects like PSEC from national clean air and water laws. A model state bill developed by the American Legislative Exchange Council (ALEC) would block federal pollution regulations when coal is mined and then burned or altered within the borders of a single state. The "Intrastate Coal and Use Act," created within ALEC's Energy, Environment and Agriculture task force, is ideal for projects like Prairie State Energy Campus, which mines and burns coal on site. By exempting the U.S. Environmental Protection Agency from overseeing permits for projects like Prairie State, ALEC's Intrastate Coal and Use Act leaves regulation to state agencies, which may have weaker pollution standards or simply lack enough staff to do their jobs, as the gas fracking boom has demonstrated. Peabody itself is a member of ALEC's anti-environmental task force, which readied the Intrastate Coal and Use Act for national distribution, and a member of ALEC's Private Enterprise Board, which may explain ALEC's role in promoting the Prairie State Energy Campus. Materials leaked to Greenpeace after ALEC's most recent conference in Washington DC show that the American Coalition for Clean Coal Electricity, a coal front backed by companies including Peabody, was showcasing Prairie State at ALEC's conference. Files in a USB drive branded with the ACCCE logo contained three promotional videos for PSEC while a paper folder with the ACCCE logo contained a promotional brochure for the Campus. The ALEC model does not appear to have been introduced in Illinois, although ALEC has been busy pushing a wishlist of state laws for its dirty energy members companies like Peabody, Duke Energy and ExxonMobil. The St. Louis suburb [Kirkwood] needed a stable, long-term power source. The plant’s developers needed customers. The parties struck a deal — a 30-year contract that would supply more than half of Kirkwood’s electricity beginning in late 2011. The kicker: The energy produced at Prairie State would be cheap compared with market power prices at the time. But now, as the first of two 800-megawatt generating units at Prairie State begin operations — six months late — the plant hardly seems the bargain it did five years ago. The $5 billion price tag is 25 percent more than when the city signed on, driving up the price of electricity that Kirkwood and other cities are obligated to buy. And construction delays mean the city is getting nothing for the monthly $296,000 checks it began writing to Prairie State’s owners in February. Because ALEC peddles copycat laws that benefit dirty and expensive coal projects while attacking clean energy incentives, renewable energy interests like the American Wind Energy Association and the Solar Energy Industries Association have abandoned ALEC. An ALEC legislator in West Virginia named Gary Howell introduced a version of the Intrastate Coal and Use Act back in 2011; his bill inspired the current model bill that ALEC is distributing. Delegate Howell suggested that all of the top 20 coal producing states consider his legislation, indicating where watchdogs should keep their eyes peeled for ALEC's model legislation. While the bills weren't passed in 2011, West Virginia is again considering the Intrastate Coal and Use Act in the 2013 session, renewing their attempts to keep the EPA from overseeing permits to burn coal from mountain top removal. Another version of the Intrastate Coal and Use Act has surfaced in Kentucky. In fact, it was the Kentucky-based Bluegrass Institute that sponsored ALEC's Intrastate Coal and Use Act within ALEC's anti-environmental task force, apparently based off of what WV Del. Howell has been introducing into his own legislature. Like ALEC, the Bluegrass Institute is a member of the State Policy Network, an umbrella organization for state and national think tanks and interest groups that are usually funded by the Koch brothers and company. Instead of being a source of low cost electricity, the first year cost of power from Prairie State is 40 to 100 percent higher than the current cost of power in the Midwest wholesale markets and is expected to remain higher than market prices for the next ten to thirteen years, if not longer. The Campus proposal was supported by former Illinois Governor Rod Blagojevich (currently serving a 14-year prison sentence for corruption charges), who publicly supported construction of the plant and ate up Peabody's false promises of cheap energy. In Big Coal, author and journalist Jeff Goodell notes that Peabody's desire to build its own coal plant was to help burn its own reserves of high-sulfur coal from Illinois, which the market did not have much of an appetite for. A representative of the Illinois Office of Coal Development told Goodell, "Most power plants are built in order to generate electricity. Prairie State was really conceived more as a platform to burn Peabody coal." While Peabody sold all but 5% of its stake in PSEC to eight nonprofit power companies, it has been the driving force behind the Campus since 2001. "Prairie State will emit more than 11 million tons [of carbon dioxide] a year, marginally less than a similar size coal plant built thirty years ago, but more than twice as much as every vehicle sold by the Ford Motor Company in a single year." Illinois' bind demonstrates the lose-lose situation promoted by the coal industry: drink and breathe our pollution now, and pay more...now and later. As clean energy becomes increasingly viable, even without considering the costs of fossil fuel pollution and climate change, some cities are taking matters into their own hands, including [the ironically-named] Carbondale Illinois, which recently established that 100% of its power will come from clean energy. Cincinnati, Ohio dumped Duke Energy and made a similar commitment, as have all municipal facilities in Austin, Texas. But clean energy advocates be warned: the more the American public recognizes that 19th Century energy like coal is a thing of the past, the more the dirty energy industries are going to spend big to desperately defend their bottom lines. Duh. That's probably what you thought to yourself when you read my headline. Fanning probably considers the much-needed conversations considering Hurricane Sandy and climate change as "ancillary" because Southern Company plays a very central and very inconvenient role in creating global warming. Apparently, Fanning's home and livelihood weren't damaged by superstorm Sandy, although his birthplace of Morristown, NJ was hit by the storm. Lucky him--out of sight, out of mind! 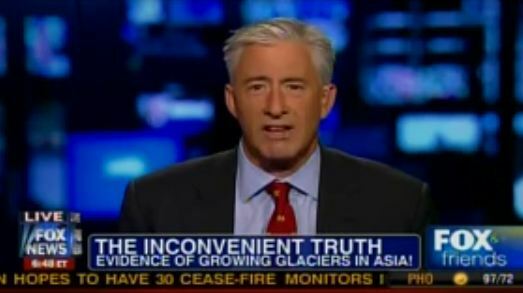 Apparently there's no need to talk about the deeper issue of global warming. 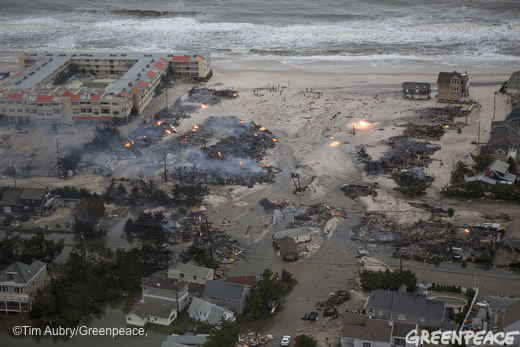 (Greenpeace photos of damage from Sandy). See, not only is Southern Co one of the nation's largest coal-burning utilities, but it creates more carbon pollution than any other utility in the country and ranks #7 in global power company carbon emissions. Southern Co is responsible for dumping over 145 million tons of carbon dioxide into our atmosphere each year, making it a key culprit in the global climate crisis. In turn, global warming creates conditions that can make cyclones like Hurricane Sandy more intense than they naturally would be, not to mention increasing the likelihood of other extreme weather events like droughts, floods, and heavy storms. If you live in the U.S., you know this year was particularly suspicious in terms of climate-related disasters. Suspicious unless you have your head in the sand, as Mr. Fanning appears to. What's worse is how much Thomas Fanning's company has paid money to stuff other people's heads in the sand with them. Funding junk science: Southern Company gave Willie Soon $230,000 from 2006-2009 for two distinct junk studies disguised as scientific research in order to confuse politicians into ignoring policy solutions to climate change. Willie Soon is a career climate science denier whose other "research" sponsors have included ExxonMobil, the Charles G Koch Foundation and the American Petroleum Institute. Funding shill groups: Southern Co. is a member of the Electric Reliability Coordinating Council, a front group run by coal utility lobbyists at the law firm Bracewell & Giuliani. Through ERCC lobbyists Scott Segal and Jeff Holmstead, Southern Co and other dirty utilities bitterly opposes any requirements for coal companies to reduce their pollution or greenhouse gases causing global warming. Southern Co is also a member of the American Coalition for Clean Coal Electricity (ACCCE), another front group opposing strong environmental standards for coal pollution. You may be familiar with ACCCE for its multimillion dollar ad buys around the election, or for its involvement in a scandal where forged letters were sent to Congress to oppose climate legislation in 2009. Buying politics: Since 2008, Southern Co. has spent over $61 million lobbying our federal government, much of which was to block environmental laws and legislation addressing climate change. Southern Co. has spent over $10 million each year on federal lobbying since 2004. To support its lobbying expenditures, Southern Co. has also sent over $1.6 million to federal politicians and registered political groups since the 2008 election cycle. In the 2012 presidential election, Southern Co. has sent $46,650 to Republican candidate Mitt Romney and $8,580 to President Barack Obama (OpenSecrets). Unfortunately for the climate and those who are now suffering from weather disasters, Southern Company is just one of many companies funding our politicians and then paying lobbyists, setting up front groups and financing hack scientists to push politicians even farther into an anti-science fantasy-land. Along with Southern are other key bad actors like Duke Energy, Peabody, ExxonMobil, Chesapeake Energy, Koch Industries and other fossil fuel interests that also want to stomp any mention of global warming out of politics, protecting billions in profit and limiting their liability over pollution problems. Understanding how these behemoths operate and coordinate makes it less surprising, though no less offensive, that we didn't hear about climate change in the first presidential debate series in over 20 years. It doesn't matter if global warming is an "ancillary" issue to Southern Company after disasters like Hurricane Sandy, or if the presidential contenders won't be honest with Americans about the problem. Our changed climate is only going to keep changing. What's on ALEC's polluter agenda tomorrow? 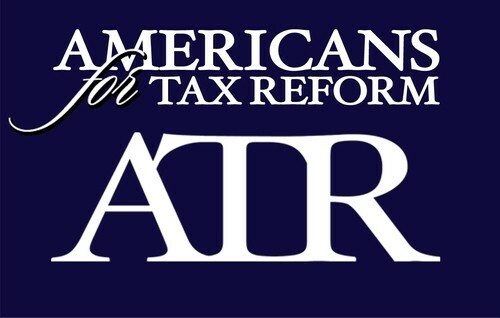 Tomorrow, the American Legislative Exchange Council--known as ALEC--will host their 2012 Spring Task Force summit in Charlotte, NC. At tomorrow's meeting, the corporate front group will round up its various committees and prepare to peddle new state-level legislation to attack clean energy laws, protect polluting industries, privatize education, and suppress voters, among other big business schemes. Need a refresher on ALEC? It's the group that brings state legislators to the table with representatives from major corporations in the sectors of energy, healthcare, tobacco, private prisons, and other groups to manipulate state politics to maximize their profits and limit their liabilities. These companies help craft template bills for state legislators to bring home and introduce in their respective statehouses. Documents obtained and published by Common Cause now give us a roster of specific attendees at ALEC's environmental meetings, a consortium of state legislators and a who's who of the most offensive polluting political heavyweights including: Koch Industries, ExxonMobil, Duke Energy and Peabody. Participating legislators know well they're walking into a dirty party, sometimes using state taxpayer money to foot the bill. 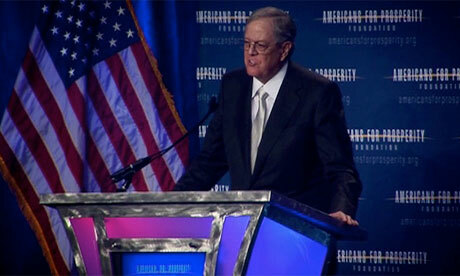 The corporations that fund ALEC are well known for their political spending on both sides of the aisle. ALEC funders include Koch Industries, known for its coordinated political spending against President Obama, and Duke Energy, which is laying down a ten million dollar line of credit to host the Democratic National Convention in their hometown of Charlotte, NC. But these polluting companies are co-conspirators under the banner of ALEC, where partisan politics are set aside to focus on the mission of destroying environmental protections, clean energy competition and liability for crimes against both people and the ecosystems sustaining us. So what exactly are ALEC and these oil, coal, chemical and public relations companies focusing on tomorrow? The "Electricity Freedom Act" (really? Electricity Freedom?!) is a new attack on states with plans requiring companies to get a certain percentage of their electricity from renewable sources. This new bill is similar to other legislation ALEC has already peddled in several states and compliments an "email and telephone campaign" against state renewable energy standards, according to the Guardian. The "Coal Intrastate and Use Act" serves to prevent EPA from overruling state permits for coal mining and producing dirty coal products (like liquid coal for fuel) if all the coal operations are conducted within the borders of a single state. The "Resolution on U.S. Conference of Mayors Climate Protection Agreement Accountability" mandates a report be filed on cities and states that have fallen short of their goals to reduce greenhouse gases through the Mayors Climate Protection Agreement, which has over 1,000 signatories. ALEC's new resolution then demands that any program that hasn't met its goal be canceled out right, voiding the Climate Protection Agreement altogether. Keeping in mind that ALEC's members like Koch and Exxon have fought greenhouse gas programs at every turn for years, it is obvious that this ALEC bill is meant for one thing, attacking programs that address carbon emissions. A resolution demanding the passage of the notorious federal REINS Act, which would give Congress the power to block the enforcement of just about any federal protection--clean air and water laws, safeguards for mine workers, prohibiting tobacco sales to kids, protection from discrimination, you name it. It's the ultimate gift from Congress to their corporate fundraisers who would like to avoid responsibility for...everything. The exhaustively-titled "Resolution Supporting a Reasonable Compliance Timeline and Economy-wide impact study of EPA’s Mercury and Air Toxics Rule" has a simple purpose: delay when coal-burning utilities have to reduce mercury pollution and other severely hazardous emissions. For major mercury polluters like Energy Future Holdings, American Electric Power, and Duke Energy, this is likely to be a popular item tomorrow. A resolution urging Congress and the State Department to push through TransCanada's Keystone XL tar sands pipeline. ALEC recycles a lofty jobs lie in their reasoning for this resolution, ignoring State Department KXL job estimates under 2,000 and a Cornell study warning that "There is evidence to suggest that the effects of KXL construction could very well lead to more jobs being lost than are created." How many jobs does ALEC assume? 120,000 -- see Greenpeace's letter to the SEC to understand how they were calculated by politics rather than reality. Go figure--the American Petroleum Institute and its largest members were in the room when this resolution was forged. A deceptive ALEC bill pushed by ExxonMobil that "discloses" chemicals used by the oil industry in fracking operations, but actually inserts loopholes to avoid disclosure of certain fracking chemicals. This bate-and-switch comes at a time when doctors are concerned about signing confidentiality agreements if they ask for disclosure of fracking chemicals when treating people who are exposed to chemicals from gas drilling. A resolution that would prevent EPA from recognizing coal ash as a hazardous substance (it contains neurotoxins, carcinogens and radioactive elements). This may well have served as the model for the coal ash amendment that is currently being tacked on to the federal transportation bill by Rep. David McKinley (R-WV). Coal ash was a repeated topic of discussion at ALEC's energy task force meetings over the last two years, according to their meeting documents. Who exactly attends these events? Beyond ALEC staff and dozens of corporate representatives, industry front groups are also represented. Tomorrow will feature John Felmy of the American Petroleum Institute in a presentation on gas prices (spoiler alert: this crowd will probably blame the President). Next up: presentations from representatives of the Edison Electric Institute (utility trade group) and the Nuclear Energy Institute (nuclear industry lobby). Perhaps most intriguing will be a chat about "The Dirty Truth Behind Reusable Bags" led by Charles Gerba, who will warn attendees that reusable bags will give them "projectile vomiting and diarrhea." Gerba may not mention this dramatic and messy sickness can be avoided by simply washing one's reusable bags, since Mark Daniels of Hilex Poly (a plastic bag company) regularly attends these meetings, and Gerba serves as an advisor to Hilex Poly. Robert Bradley of the Institute for Energy Research, which made press recently when its sister group the American Energy Alliance spend $3.6 million on ads blaming the President for high gas prices. IER has a former Koch lobbyist on staff and has received $175,000 from Koch foundations in recent years as part of the climate denial network. James Taylor of the Heartland Institute, which has helped champion ALEC efforts to confuse K-12 students about climate science. Heartland is currently in the middle of a crisis as corporate funders are distancing themselves from its comparison of terrorists and serial killers to those who recognize the reality of global warming. Seriously, they put the Unabomber on a billboard saying, "Do you still believe in global warming? I do. www.heartland.org"
Craig Idso, whose nutjob Center for the Study of Carbon Dioxide and Global Change has been paid by the coal industry and the Heartland Institute to tell people that global warming is good for the planet. Craig Idso explained this nonsense to state legislators in August. As is the pattern here, see the Center's history of Koch- and Exxon-funding, as well as Idso's former employment at Peabody and work for the Western Fuels Association. Stephen Miller of the American Coalition for Clean Coal Electricity, which spends big on national advertisements promoting the idea that perhaps coal isn't inherently dirty, dangerous and deadly (it is). Miller, who is resigning from ACCCE this year after serving as a dilligent coal apologist for the last decade, came under Congressional fire in 2009 when it was revealed that ACCCE contractors forged letters on behalf of groups "representing senior citizens, minorities and veterans," including the NAACP. Dezenhall Resources, which Businessweek calls the "Pit Bull of Public Relations." Dezenhall Resources is currently included in a Greenpeace lawsuit due to its role in hiring spies on behalf of chemical companies to track Greenpeace's internal campaign plans.